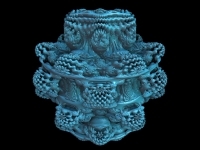 Many of you will be familiar with the 2-dimensional Mandelbrot set – the most common fractal. However, it was not until recently that a 3-dimensional analogue was created after many years of blood sweat and tears. This incredible object is the 3-D Mandelbulb and like the Mandelbrot set you can zoom into this structure to discover new and exciting “worlds”.